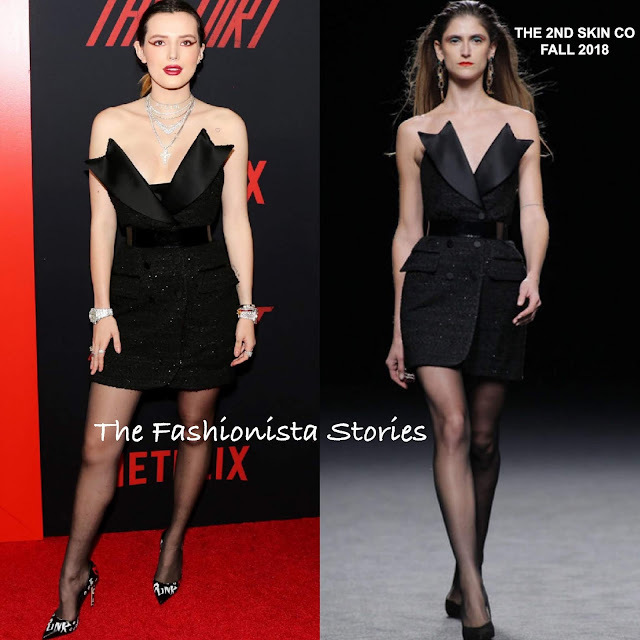 Yesterday evening(March 18th) Bella Thorne attended the Netflix premiere of 'The Dirt' at Arclight Hollywood Theatre in Hollywood, California. She posed on the red carpet wearing an all black look which featured an THE 2ND SKIN CO FALL 2018 strapless tweed & satin lapel tuxedo mini dress, that was belted at the waist. Her mini dress was accessorized perfectly with sheer black stockings & LE SILLA pumps and sparkly jewelry. On the beauty end, she went with a red winged eye & lips and a pulled back up do. However the eyes is a no for me. Overall, her look speakes to the tone of the movie which is probably what she was going for. What do you think of Bella's look?